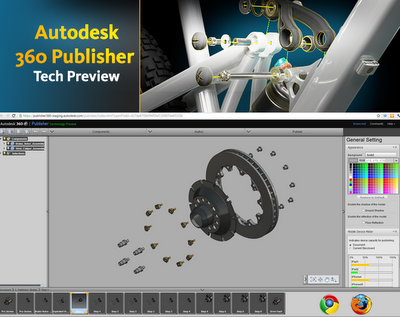 The newest member of the quickly spreading Autodesk 360 cloud family is the "Autodesk 360 Publisher Technology Preview". This cloud version of the well known desktop application Inventor Publisher can easily create visual instructions for assembling, installation, maintenance and repair of designed products - directly from the 3D CAD data. Three-dimensional electronic instructions with step-by-step animations are very easy to understand and you can simply share and view them in a standard internet browser or on mobile devices - Apple iOS or Android (tablets and mobile phones). To use Autodesk 360 Publisher you need only an internet connection and your login to Autodesk 360 cloud services (a standard Autodesk ID). The web application runs directly in your web browser (supported are Google Chrome and Firefox - WebGL). You can process existing Inventor Publisher files or 3D models from Inventor (IPT, IAM), Fusion (DWG), Autodesk 123D (DWG), or DWF. The output documents can be published on Autodesk cloud, shared and viewed online, anytime and anywhere you are. You can publish the documentation either privately or publicly. This "technology preview" version is free, it is time-bombed till 20th November 2012 and it is currently limited to the USA and Canada (other geos will be added).